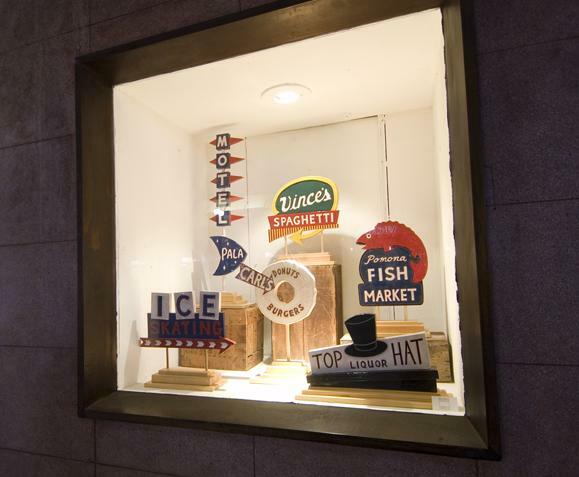 These miniature versions of a half-dozen classic Inland Valley signs were done by artist Paul Knoll and are, or at least were, being displayed in a Pasadena storefront. See a short writeup here. Thanks to Chris Nichols for the link. Well, two of them are right across Holt from each other. I confess that I don’t know the other ones, however. Pala and Carl’s are both also on Holt and Top Hat is just off Holt on Dudley. Funny thing about “icons” — I have no conscious recollection of ever driving by Top Hat Liquor (and, in the day, I drove to plenty of liquor stores), but I immediately recognized that sign. P.S. Can we expect an on-the-scene report on the re-opening of the Padua Hills Theater? Perhaps another thread here too? School Field Trips of the Inland Empire. In Claremont in the ’50s, 1st graders went to the Humane Society (Humane Way and Mission in Pomona — still there! ), 2nd graders got a bus ride to Colton to ride the train back to Claremont, and the Thanksgiving Pageant at Pilgrim Place was also on the annual list. come on up and do a story on the “new” Padua Hills Theatre as only you can do !! I’ll be lookin’ for ya! I believe it was third grade we took a field trip to the Raymond M. Alf Museum of Paleontology in Claremont and got our picture in the Daily Report. This would have been 1977-1978. Here are three school field trips within the IE that immediately come to mind. Shelton’s Turkey Ranch. Did this trip 2-3 times, and the one thing I remember was being told that turkeys had to be closely watched because they could actually drown while standing in the rain. Regina Winery/Brookside Winery. Visited each of these on several occasions. I believe Brookside gave all the kids a drink of grape juice at the end of the tour.